Years after leaving the Theatre School, I was invited back to be part of the team working behind the scenes for their 2016 Variety Showcase – a fantastic event which takes place once every two years. I had no idea of what I was letting myself in for – it was such hard work. But from the rehearsal room right up to the opening night, the professionalism and work ethic of all the children involved in the show was outstanding. During the shows I had to constantly remind myself that these were just children- not professionals- and children who took part in these shows because of their love of performing. And oh can they perform! ‘Saturday Night Fever’ opened the show with an electric energy along with the funky 70’s choreography to match. The student’s pulled off there double pirouettes with finesse and still performed as if they were in a 70’s downtown night club without missing a beat. ‘Back to the Old School’ (a personal favourite of mine) had fast paced, up-beat, intricate choreography which seemed like no challenge for the students who danced up and down the stage. Even the little ones showed they could hold their own when it came to creating patterns and breaking it down, taking the entire audience back to the 90’s era. ‘Everything was brought right back to reality with ‘Newsies’; A strong narrative with the dance and acting to match it. The students showed their ability to hold an audience and tell a story all while knocking out the challenging Choreography. Act 2 opened with the Heartfelt ‘We Remember’ section. The students showed their vulnerable side in the lyrical poppy dance as they turned and tilted throughout the routine to commemorate the fallen soldiers behind them. But the Stand out section for me was ‘Motown’. The students showed mature and polished performances – taking us back through the classic Motown hits all so seamlessly and putting a smile on the audiences’ face. The students were a pleasure to watch on stage and an even bigger pleasure to work with off stage. Which is a real credit to them but also to the fantastic training and support they get at D&B. I would be lying if I said I wasn’t a little bit jealous of them – especially their sheer enthusiasm and joy of performing. 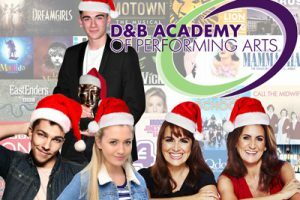 D&B theatre school has grown even from when I was first training there and the shows are proof of that. As for the students? Well without doubt – they are all stars in the making!